Got few questions. The pieces show quite of a wear but wonder about the brown on the bottom, the lips at the opening and the underside of the lids. You can see from the cracks on the bottom that the brown goes deep. So it is not painted to simulate age.Any explanation for that? 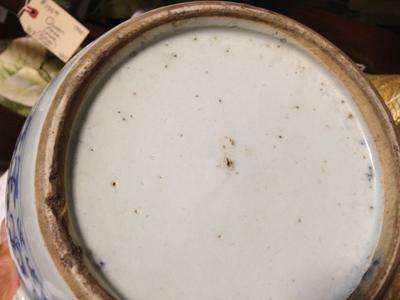 Not sure if the first pot is marked but on the second one the bottom has something like inscribed two characters.Any idea what do they read? Finally, what is your opinion on the age of the pieces? Thanks guys. So what is the rules with the colors. The light blue, like in the case of the first pot means newer and the dark blue older? By the way, the marks are done after the firing process. I just noticed that the lid on the light blue pot is also inscribed. What does it say? I think that as a very bad idea to scratch the lid in such a way. At least whoever did it could have done it on the bottom like the other one. I still cannot figure out what is the deal with the brown coloring of the rims. Is that natural? Your are right with the marking, but I have some doubts about the characters being made "before" firing for three reasons. 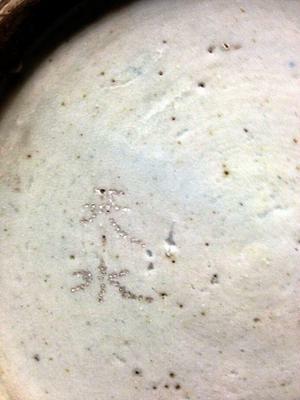 The characters are made by punching many small holes into the glaze. This method would not be required before firing as the unfired glaze can easily be sratched. 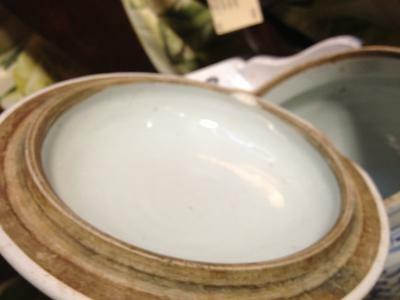 The punching of holes is needed because the glaze is vitrified, very hard after firing. Secondly, at 1150-1400 degree Celsius the glaze is liquified and would fill the holes at least partially. A kiln load would contain hundreds or even thousands of items to be worth the effort. I don't think they would know already who would buy the items later and mark them. The two characters seem to mean "sky water" and according to an art dealer, they had been sculpted with needles to indicate ownership before the piece was fired in a common kiln. 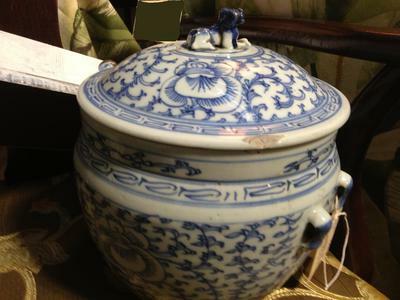 The second one is probably from about the Jiaqing/Daoguang reigns of the Qing dynasty, the first one towards the end of the Qing dynasty, judging by the type of blue color used. The type of characters on the bottom is mentiond under "Marks".